The film that made Peter Lorre an international star. He plays a psycho who can't control his urge to kill. Just before a killing, he whistles "In the Hall of the Mountain King." Chilling. In German with English subtitles. CLICK IMAGE FOR DETAILS. A William Castle extravaganza! He had an insurance policy that he heavily promoted, securing him in the event someone died of a heart attack while watching the film. This one involves a doctor looking for his lost daughter. Who is reportedly -- buried alive somewhere in town! Orson Welles restored masterpiece. Shakespeare with tragedy,horror...filled with witches, shadows, struggles and real creepiness as MacBeth murders his way to power that corrupts. Also stars Jeanette Nolan (Aunt Ada from NIGHT GALLERY), Roddy McDowell and Alan Napier. MACISTE IN KING SOLOMON'S MINES (1964)/MACISTE AGAINST HERCULES IN THE VALLEY OF WOE (1961) - Double Feature. CLICK IMAGE FOR DETAILS. Stars John Ashley, Angelique Pettyjohn and Ronald Remy. Horror from the Phillipines! Indeed! A vacationer lands on an island and discovers a mad doc who is working on experiments that result in monser-zombies. Lionel Atwill is mugging for the camera with an evil twinkle in his eyes! Atwill stars as the loony doctor stranded on an island with a group of vacationers. There he plans on becoming a god to the natives by bringing people back from the dead. At least, that's the plan. Stars John Barrymore. Marian Marsh, Charles Butterworth and Boris Karloff. An insane puppeteer lives his life's dreams through a famous ballet dancer. His twisted mind attempts to destroy the dancer's life in an evil power play. Boris Karloff on a small role, pre-FRANKENSTEIN as an abusive father. Riding on the coat tails of HOUSE OF WAX came this chiller also starring Vincent Price. A practitioner of the black arts does magic, but when his long awaited show is to begin, the producer cancels it. He goes more than a little nuts...doing his own shows that now include horrible murders. The puppetmation feature length film about a monster party at Frankenstein's island. The nephew of Dr. Frankenstein receives a request for the get-together. Other guests include Dracula, The Wolf Man, The Hunchback, Mr. Hyde, The Creature, Frankenstein and his mate. Click for more details! Digitally remastered from a 35mm print. The puppetmation feature length film about a monster party at Frankenstein's island. CLICK IMAGE FOR DETAILS. A doctor (George Zucco) performs experiments on his gardener (Glenn Strange) and creates a wolf man. If you're looking for a poverty row horror from the golden age that's not boring -- this is it! A doctor (George Zucco) performs experiments on his gardener (Glenn Strange) and creates a wolf man. If you're looking for a poverty row horror from the golden age that's not boring -- this is it! Restored Classics Series from The Film Detective. Stars Stella Stevens, Shelley Winters and Beverly Garland. A companion for an elderly woman has her two siblings (freshly released from an asylum) come to lie with her at an old mansion. A surreal early talkie. It begins as a "bedroom farce" type comedy with a cheating husband. The wife decides to dress as a devil at a costume ball that is held on a zeppelin! Parachuting visitors, a wild climax and it turns to be one of the weirdest films ever made. Directed by Cecil B. Demille. Vincent Price is basically playing himself - a classic horror actor. His claim to fame is a character named Dr. Death (a skull faced Phantom-like cloaked murderer). Vincent is diagnosed with mental problems and is Dr. Death becoming...real? Peter Cushing co-stars. Featurette, trailer. Stars Anthony Hopkins, Burgis Meredith, and Ann Margaret. Hopkins as a ventriloquist and one evil looking dummy that seems to have a life of its own. Eerie thriller. The grandfather of special effects was George Melies. These bizarre short 15 films feature ground breaking special effect in the film medium. THE MERMAID, THE BLACK IMP, THE ECLIPSE, THE IMPOSSIBLE VOYAGE and more. Plus the documentary "CINEMA MAGICIAN." Costume adventure with young man facing odds of an evil wizard (Basil Rathbone). Dragons and witches. Shocking scene with an ugly witch portrayed by the infamous Vampira. CLICK IMAGE FOR DETAILS. A magnetic disturbance could throw the earth out of orbit and destroy all life. Richard Carlson, the A-Man from the Office of Scientific Investigation discovers this magnetic monster's origin is atomic. It's a sci-fi race against time to destroy the atomic particles that have a life of their own. Stars Basil Rathbone, Bobby Breen, Henry Armetta, and Marion Clare. A brilliant composer (Basil Rathbone) decides to get away from it all and heads for a mountain retreat. CLICK IMAGE FOR DETAILS. Very dated as 1960s pop culture. It's the "Laugh-In" TV hosts Rowen and Martin in their version of a horror comedy. Martin buys a house that turns out to have werewolves and vampires for neighbors. Huge cast with Julie Newmar, Carol Linley, Fritz Weaver, Robert Reed and many more. Stars Harry Houdini, Arthur Maude, Albert Tavernire and Jane Connelly. A man is frozen alive in the arctic (Houdini) and is revived 100 years later. CLICK IMAGE FOR DETAILS. Jack Palance plays a quiet, myserious lodger of a rooming house attic in London. After he arrives, woman are being found murdered in the area. CLICK IMAGE FOR DETAILS. A very entertaining Hollywood version of the life of Lon Chaney Sr. James Cagney is very, very good and the make-ups are fun, though not as refined as the classic Chaney make-ups. CLICK IMAGE FOR DETAILS. Stars Charles Laughton, Burgess Meredith and Franchot Tone. A psychopath in France murders for money and sets up a young student to take the blame. Stars Roland Young, Joan Gardner nd Ernest Thesiger. A simple man is mystically granted the powers of a god. Through his normal life he tries to use them for good....but does ultimate power, ultimately corrupt. Dark comedy fantasy from England. Peter Lorre stars in this Alfred Hitchcock thriller as an assasin. Lorre and cohorts kidnap a young girl to keep the parents quiet. Lorre's first English-speaking role. A group of renegade scientists are working on a way to keep eternally young. They use young women, extract their life forces and electronically transfer them to another. Only problem is, you need to keep doing this or the youth-subject becomes a hideous zombie. Boris Karloff, Holed up in a sub-basement of an old house, experiments after being revived from a state of suspended animation. CLICK IMAGE FOR DETAILS. Stars Edward Morris, Marlo Dwyer, Frederick Burton and Elenor Lawson. A man is revived from the dead after a car accident. The now saved man begins showing the traits of an executed cold blooded gangster. CLICK IMAGE FOR DETAILS. Stars Frank Sinatra, Angela Lansbury, Janet Leigh. A political chiller with touches of science fiction and dark humor. You've never seen Angela Lansbury in such a role, evil and insidious, A thrill ride of twists and terror. Lots of extras: featurette with Lansbury, interview with Sinatra and more. Stars Charlotte Henry, Eddie Quillan, Rita LaRoy and Franklin Pangborn. A valuable "Mandarin Stamp" is stolen in New York and multiple murders are the result. CLICK IMAGE FOR DETAILS. MANEATER OF HYDRA (1967) Move over Triffids...here comes a walking vampire-plant that is killing off tourists on a remote island. COUNT DRACULA'S GREAT LOVE (1973) stars Paul Naschy. School girl's are stranded at an asylum headed by Count Dracula himself, things just keep getting worse from there. Stars John Bromfield, Lon Chaney Jr. and Victor Jury. Lon Chaney Jr. in one of his finest roles of this time period. A search for treasure leads to madness on the seas. Chaney is a good natured first mate in this tale based in part on Edgar Allan Poe's stories. A great seldom seen horror with Peter Cushing and Donald Pleasance in a re-telling of THE BODY SNATCHER. Cushing is the medical doctor needing bodies and Pleasance, one of his hired men. Chilling and gruesome. CLICK IMAGE FOR DETAILS. One of the most bizarre movies of all time. A psychopath kills his nutty employer and assumes his idenity. The maniac then causes terror and depravity to all who get involved with him. CLICK IMAGE FOR DETAILS. One of the most bizarre movies of all time. A psychopath kills his nutty employer and assumes his identity. The maniac then causes terror and depravity to all who get involved with him. Definitely borrows from Edgar Allen Poe stories. A walling up scene, a black cat and general insanity. Stars -- Torgo. Oh man, I like all kinds of horror and sci-fi, but if you really want to hurt yourself, this is it. Whewwww-weeee. CLICK IMAGE FOR DETAILS. Over 15 hours of Sherlock Holmes films. 8 movies that include a couple of rare Christopher Lee appearances. Movies: A STUDY IN TERROR, THE LEADING LADY, INCIDENT AT VICTORIA FALLS, STUDY IN SCARLET, SIGN OF FOUR, MURDER AT THE BASKERVILLES, DRESSED TO KILL, TERROR BY NIGHT. Plus 5 TV shows. Stars Herbert Lom, Udo Kier, Olivera Katarina and Reggie Nalder. A trashy exploitation horror film that used nasty gimmicks to the max. Advertised as the most horrifying movie ever made. Gory and unsavory. DVD includes a replica "barf bag" that was issued at theatrical screenings. Yeeesh. Onslow Stevens and his evil gang dress as gorillas to frighten the local natives in Africa away from a sacred spot. It's a spot where Nazis had buried a treasure that Stevens wants. Jungle Jim (Johnny Weissmuler) investigates! A double feasture comprising of a 1951 episode of the early TV show "Lights Out." This episode is called THE MARTIAN EYES and classic show THE NIGHT AMERICA TREMBLED is also included. CLICK IMAGE FOR DETAILS. Rock Hudson, Roddy McDowell, Darren McGavin and an all-star cast. The TV epic mini-series that runs 293 minutes. Ray Bradbury's vision of discover, wonder and doom as we try to colonize the red planet Mars. Amazing series of interwoven stories of warmth, compassion, and the darkest evil. Peter Lorre is an investigative reporter looking into the death of a master criminal. The weird web of events lead him to wonder if the dead killer is really alive...and stalking him. Sidney Greenstreet co-stars in this dark, film noir. Lorre is simply wonderful. Starts Paul Stevens and Claudette Nevins. A cursed tribal mask causes the wearer to have hallucinations that would make H.P. Lovecraft pretty uneasy. Eerie stuff from Canada. Filmed in 3-D. Listen for the voice in your head..."Put the mask on!" Includes 1 pair of 3-D glasses. A cursed tribel mask causes the wearer to have hallucinations that would make H.P. Lovecraft prettty uneasy. Includes 1 pair of 3-D glasses and the film has dream 3-D sequences. CLICK IMAGE FOR DETAILS. Four great Vincent Price films in this collection: MASQUE OF THE RED DEATH (1964), THE PIT AND THE PENDULUM (1961 with Barbara Steele), TALES OF TERROR (1964 with Peter Lorre and Basil Rathbone), and MADHOUSE (1974 with Peter Cushing). Two classic Vincent Price AIP films. 1964's MASQUE OF THE RED DEATH, directed by Roger Corman and co-starring Paul McCartney's girlfriend at the time - Jane Asher. MADHOUSE features Vincent Price, Peter Cushing and Robert Quarry (Count Yorga). Stars Vincent Price, Henry Hull, Charles Bronson andMary Webster. Victorian sci-fi with it being almost a Captain Nemo in the air story. Price is a crazed captain of a flying airship. Price plays Robur, ready to destroy the world's armies in the name of peace. Two classic episodes of THIS IS YOUR LIFE: Boris Karloff and Vincent Price. A wonderful, personal look at the lives of these two great stars of horror films. Karloff's episode features surprise guest, make-up master Jack Pierce! A must for Karloff and Price fans. MASTERS OF MAYHEM - Triple Feature: THE BAT (1958), THE GORILLA (1939), and HORROR HOTEL (1960). CLICK IMAGE FOR DETAILS. This DVD features three milestone silent horror films. NOSFERATU, THE GOLEM and THE CABINET OF DR. CALIGARI! Plus, as a bonus, the only surviving footage of a rare silent film called GENUINE: A TALE OF THE VAMPIRE. CLICK IMAGE FOR DETAILS. Stars John Goodman and featuring William Shallert. In a twisted, loving send-up of William Castle and 1950s sci-fi movies, MATINEE is a joy. Goodman is fabulous as a movie huckster, and the Cold War era storyline is perfect. It's a throwback! New 4K Master! Stars Richard Carlson. A man suddenly breaks his engagement with a beautiful girl right after a mysterious phone call. He returns to Scotland to inherit his uncle's castle. Confused, his fiancee heads to Scotland. What she finds is a castle is a creepy, supernatural mystery! THE MECHANICAL MAN (1921 )/THE HEADLESS HORSEMAN (1922) - Double Feature. CLICK IMAGE FOR DETAILS. Stars Fay Wray, Jean Hersholt, Walter Woolf King and Astrid Allwyn. Directed by Earl C. Kenton. CLICK IMAGE FOR DETAILS. Six classic installments of the Sherlock Holmes series produed by Granada Television and starring Jeremy Brett as the eccentric detective. CLICK IMAGE FOR DETAILS. Two bizarre, unearthly cult films! THE MERMAIDS OF TIBURON - Sunken treasure protected by beautiful and mysterious mermaids. Weird fantasy! Both original and explicit "added footage" versions included. CRY OF THE BEWITCHED - Sorcery on a Cuban sugar plantation in 1850. Click image for details. A mad scientist (Jackie Coogan) creates a race of women with attributes of spiders. Also stars Richard Travis and Allan Nixon. Also known as: ATTACK OF THE SPIDER WOMEN and LOST WOMAN. MESA OF LOST WOMEN/THE BEAST OF YUCCA FLATS - Double Movie Pack. CLICK IMAGE FOR DETAILS. METROPOLIS (1926)/THE WIZARD OF OZ (1925) - Silent Film Double Feature. CLICK IMAGE FOR DETAILS. 4 dark mysteries from the 1940s starring Lloyd Nolan as detective Mike Shane. The creepiest on this set is THE MAN WHO WOULDN'T DIE. Also in the set: MICHAEL SHANE - PRIVATE DETECTIVE, SLEEPERS WEST and BLUE, WHITE AND PERFECT. These are great films! Stars John King, Marjorie Reynolds, George Cleveland, Edward Keane and Monty Collins. There's a phantom aboard a train line that assaults, kills and steals passengers money. CLICK IMAGE FOR DETAILS. Stars Leo Gorcey, George Zucco and Ann Savage. The body of a well-known criminal is found in a wax museum. Hired help Leo Gorcey and the girl reporter who lives upstairs are trying to make sense of things and stay alive. CLICK IMAGE FOR DETAILS. Four cult classics from the demented mind of director Ray Dennis Steckler: THE LEMON GROVE KIDS MEETS THE MONSTERS (Bowery Boys parody with Bob Burns as The Mad Mummy), THE INCREDIBLY STRANGE CREATURES, ADVENTURES OF RAT FINK AND BOO BOO (Kogar The Gorilla!) and THE THRILL KILLERS. Stars Reginald Denny, Claudia Dell, Lloyd Huges and James Farley. It's the 1930s gangland era and crime is rampant! CLICK IMAGE FOR DETAILS. Stars William Boyd and Claudia Dell. Murder and mayhem revolve around the local mortuary. Shakespeare hit Hollywood with an all-star cast and, even more stunning, the photography and effects. A Fantasy world of gnomes, animal-people, and magic in breathtaking beauty and mystery. Amazing film. CLICK IMAGE for more details. Stars Wolfgang Preiss. A weird doctor in a haunted mill is killing young women and making staues out of them....like a twisted spin of MYSERY OF THE WAX MUSEUM. He's using the victims to keep a daughter alive. A young art student stumbles onto him and real horror begins. The boys from the bowery are here -- Leo Gorcey, Huntz Hall, Sammy Morrison and the others. The kids stop a robbbery, but it gets them in a sticky mess. The tough streets of New York captured on the screen with the East Side Kids. Stars Rory Calhoun, Virginia Grey. A plane full of different personality types crashes in darkest Africa. The band of people include a hijacker, a gangster, a snooty rich woman, a blind woman and some will stop at nothing to survive. Hungry crocs and wild apes mix things up! Stars Glynis Jones, Griffith Jones and Googie Withers. A doctor takes a fishing holiday of the coast in Europe. He catches more than fish, he catches a beautiful mermaid! He returns home with an "invalid patient," with her legs covered. A wonderful fantasy from the 1940s. A body of a newspaper man is shifted from place to place by the competing newspaper's editor, so he won't be implicated in the murder. CLICK IMAGE FOR DETAILS. Stars Brigitte Helm (METROPOLIS). Deep beneath the sands lies the remains of the lost continent of Atlantis. Atlantis - filled with mysery, adventure and thrills. The classic novel from director John Huston and screenwriter Ray Bradbury. Gregory Peck as mad Captain Ahab. Ahab was disfigured by a monstrous whale and he searches for it. Powerful movie of revenge, perseverance, fury and amazing visions of the sea and the inner workings of the human soul. Stars Hugh Beaumont, Frances Rafferty and Harlan Warde. Pyscho film noir thriller! A woman is rescued by a deranged murderer and falls in love, not knowing his dark secrets. A huge meteor crashes to earth, splintering into chunks of rock. After rain (just add water) the fragments grow into monolithic monsters that move and crush everything in their path! Cool sci-fi! Also Known As: ISLAND OF FORGOTTEN SINS. Stars John Carradine, Gale Sondergaard, Sidney Toler, Frank Fenton, Rita Quigley and Betty Amann. CLICK IMAGE FOR DETAILS. A John Carradine thriller double feature! 30, count 'em 30 home made monster movies by people like Bob Burns (1950s special effects), Frank Dietz (Disney Artist), Kerry Gammill (Superman comic artist and Monster Bash Magazine cover artist), Tom Weaver (Author) and many more. Click image for more details. Back in stock! The golden age of horror films is examined by Forrest J Ackerman, Christopher Lee, Sam Arkoff, Janet Leigh and Greg Mank. From the silent horrors of Lon Chaney through the rise of classic monsters at Universal Studios in the 1930s and 1940s. 90 minutes. A feature documentary on the classic horror and science fiction films of the 1950s...atomic age creations, aliens from other worlds and teenagers! Filmmakers and actors augment this history of the period in fantastic films. Forrest J Ackerman too. A feature length documentary on the cult films of the late 1960s through the 1970s. Actors, directors and technicians unfold the story of horror cinema in the period. From BLACULA to PLANET OF THE APES, 2001 and into the 1980s. A doctor injects a man with deforming acromeglia, making him hideous. A murderous gorilla is thrown in for good measure to complete the party. Nicely filmed B budget programmer. J. Carrol Naish stars. Stars Maureen Brown and Gin Mart. Creepy Italian film with a cloaked madman who wears a skull mask and black robe. He lives in an underground sub-basement below a monestery. He kidnaps young girls and, well....you guessed it -- embalms them. Twisted Italian chiller. Also known as: THE EMBALMER. Stars Maureen Brown and Gin Mart. Creepy Italian film with a cloaked madman who wears a skull mask and black robe. CLICK IMAGE FOR DETAILS. A group of kids that have their own monster club discover that Dracula is really alive and in search of a powerful amulet that will give him control of earth. Dracula enlists the aid of The Frankenstein Monster, The Mummy, The Wolf Man and The Gillman. It's up to intrepid kids to save our world. Low budget chiller with some real charm. Stagey, but full of lightning and thunder outside a dark house with a killer loose. A gorilla with an attitude is kept in the basement. Light weight cardboard packaging. DVD features two feature films and a cartoon. Features: THE BRAIN THAT WOULDN'T DIE (1958) and THE BEAST OF YUCCA FLATS (1961). The cartoon is a 1940s Superman story called "The Arctic Giant." MONSTERS - 20 MOVIE DVD SET. CLICK IMAGE FOR TITLES AND DETAILS. The disc contains four DVDs with two of Boris Karloff chillers: THE HAUNTED STRANGLER (1958) and CORRIDORS OF BLOOD (1958). Also, classic sci-fi THE ATOMIC SUBMARINE (1959) and FIRST MAN INTO SPACE (1959). Thrillers produced by the brothers Alex and Richard Gordon. Criterion! MONSTERS CRASH THE PAJAMA PARTY - Spook Show Spectacular (1965). A hoodoo voodoo DVD jam-packed with monster fun that doesn't seem to end! CLICK IMAGE FOR DETAILS. MONSTERS UNLEASHED (9 Movie Set). Stars Gamera and other fine actors. Extras include trailers, poster gallery and a history of monster movies. CLICK IMAGE FOR MOVIE LISTINGS. Also known as: THE ATOMIC BRAIN. An older woman wants a new body and farms out work to the local mad scientist. Young girls are located and experimented on. One somehow ends up with a cat brain. Crazed dementia. Made-for-TV werewolf movie starring David Janssen. Janssn investigates a series of full moon murder where the victims throats are ripped-up. It's a werewolf on Louisiana bayou! 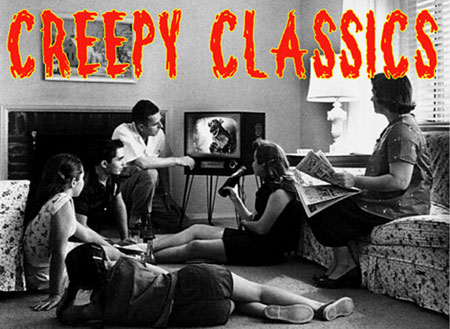 A classic made-for-TV werewolf movie and a rare grindhouse horror on one DVD. CLICK IMAGE FOR DETAILS. Stars James Olson. Hammer Films goes into space. A salvage/future garbage collector and re-seller gets trapped into an underworld of space crime. Actually lots of fun with an old western kinda feel transplanted into space. Widescreen. THE MOONSTONE (1934)/MURDER AT MIDNIGHT (1931) - Double Feature. CLICK IMAGE FOR DETAILS. Leslie Banks portrays the ultimate hunter who tracks and kills the most dangerous game on his island -- humans! Well-acted and filmed on the KING KONG sets. CLICK IMAGE FOR DETAILS. Leslie Banks portrays the ultimate hunter who tracks and kills the most dangerous game on his island -- humans! Well-acted and filmed on the KING KONG sets. Dig that crazy trophy room full of heads! Bonus: Betty Boop cartoon, Clyde Beatty newsreel. THE MOST DANGEROUS GAME (1932)/BIRD OF PARADISE (1932) - Joel McCrea Double Feature. CLICK iMAGE FOR DETAILS. AKA: MY SON, THE VAMPIRE and OLD MOTHER RILEY MEETS THE VAMPIRE, VAMPIRE OVER LONDON. An old woman gets involved with an evil scientist (Bela Lugosi) who sleeps in a coffin during the day. A comedy-horror that has Lugosi donning his Dracula cape again! Short comedies of the silent era that include: SCARED SILLY (1927), GOOFY GHOSTS (1928), SAILOR BEWARE (1927), A MANDARIN MIX-UP (1924) and more. Rare comedy shorts from the collection of film historian John K. Carpenter. Four horror films from the vaults of MGM studios: THE VAMPIRE (1957 with John Beal and Ken Tobey), THE SCREAMING SKULL (1958), THE VAMPIRE LOVERS (1970 Hammer Horror) and THE BAT PEOPLE (1974). Four movie classics from MGM: THE MAN FROM PLANET X (1953), BEYOND THE TIME BARRIER (1960), THE TIME TRAVELERS (1964) and THE ANGRY RED PLANET (1959). Four movie classics from MGM: THE AMAZING TRANSPARENT MAN (1960), REPTILICUS (1962), THE NEANDERTHAL MAN (1953) and THE BRAIN THAT WOULDN'T DIE (1959). Four classics in horror: THE FACE OF MARBLE (1946),I BURY THE LIVING (1958), THE FOUR SKULLS OF JONATHAN DRAKE (1959) and THE SNAKE WOMAN (1954). Click image for details. Stars Carole Lombard, Robert Montgomery and Gene Raymond. Directed by Alfred Hitchcock. A couple accidentally discovers themselves unwed! CLICK IMAGE FOR DETAILS. The first volume here includes the following great features: MR. MOTO TAKES A CHANCE (1938), THE MYSTERIOUS MR. MOTO (1938), THANK YOU MR. MOTO (1937) and THINK FAST MR. MOTO (1937)! CLICK IMAGE FPR DETAILS. Stars William Powell, Ann Blyth. Mr. Peabody tells the story of when he caught a fish...a big fish. He keeps her in a large ornate fountain-pool at a resort he's renting. A magical fantasy shot at the same time ABBOTT AND COSTELLO MEET FRANKENSTEIN was shooting on the same lot. Stars Leo Gorcey, Huntz Hall, Bobby Jordan and Sammy Morrison. One of the East Side Kid's buddies is headed for the electric chair. Can the kids save their friend before he fries? Boris Karloff stars as Wong. Movies on this set include: MR. WONG - DETECTIVE, THE MYSTERY OF MR. WONG, MR. WONG IN CHINATOWN, DOOMED TO DIE, THE FATAL HOUR and THE PHANTOM OF CHINATOWN. CLICK IMAGE FOR DETAILS. A Mr. Wong entry with Boris Karloff in the title role investigating murder. Watch out for those poisonous darts! MR. WONG MYSTERY COLLECTION - 4 DVD Wooden Box Set: DOOMED TO DIE/THE FATAL HOUR/THE MYSTERY OF MR. WONG/PHANTOM OF CHINATOWN/PHANTOM OF CHINATOWN (1940). CLICK IMAGE FOR DETAILS. Boris Karloff as Wong attends a high society party where a man play-acting really is murdered. Mr. Wong snaps into action. The Munsters complete TV series, both movies, and loads of extra features. CLICK IMAGE FOR DETAILS. MUNSTERS FRIGHT FEST: MUNSTER, GO HOME/THE MUNSTERS REVENGE (Double Feature). Both feature films! CLICK IMAGE FOR DETAILS. Rare episode now in color! CLICK IMAGE FOR DETAILS. Stars Jack Mulhall, Mischa Auer, Josephine Dunn and Martha Mattox. One of those "Forgotten Horrors" of the 1930s with Kenneth Strickfadden lab equipment sparking as a scientist catures the power of the sun. CLICK IMAGE FOR DETAILS. Stars John Miljan, Irene Ware, Iris Adrian and Noel Madison. A country mansion is invaded by gangland killers and murder turnd to murder. CLICK IMAGE FOR DETAILS. Stars Aileen Pringle, Alice White, Hale Hamilton and Robert Elliot. A play has an actor's character die at the end of each performance. Then, during a game of Charades, he really does mysteriously die. A creaky, fun who-done-it from the early 1930s. Stars Arthur Wontner and Ian Fleming. Sherlock Holmes is on the track...at the track! Conspiricy and murder race at a horse track and Holmes investigates. A favorite portrayal of sleuth Sherlock Holmes by Christopher Plummer. He faces old England's most notorious madman - Jack the Ripper. Also stars James Mason and Donald Sutherland. Directed by Bob Clark. Stars Wallace Ford, Marian Marsh (DR. JEKYLL AND MR. HYDE), Sarah Padden and Gavin Gordon. CLICK IMAGE FOR DETAILS. Four years after DRACULA, Bela Lugosi is playing a dual role as twin brothers...and television invention is winding down the road to science fiction! Could TV's become death ray devices?....duck! Stars Fred MacMurray. Mash-up of THE OLD DARK HOUSE and ARSENIC AND OLD LACE. A pollster looks for a missing co-worker in the mountains. Leads him to a bizarre, eccentric, homicidal hillbilly family. Before long he's searching a spooky house for hidden treasure with the scary lunatics. Really fun! Stars Lyle Talbot, Ann Dvorak, Gordon Westcott and Robert Light. A government secret formula is being transported to the capitol with an ace piliot overseeing the mission. CLICK IMAGE FOR DETAILS. Stars John Harron, Phyllis Barrington and Henry B. Walthall. A politician is murdered and museum sideshow freaks become involved in this strange oddity from the early thirties. A forgotten, creepy mystery....not over easy - hardboiled! Also Known As: MURDER IN SOHO. An American gangster is holing up in England. When a man realizes who his is..it sets him on a killing spree. Can Britian's Scotland Yard track the mad killer down in the streets of Soho? If you're a Tod Slaughter fan, you must have this one. Tod goes totally spastic as a deranged, lecherous, no-good slimy evil-doer. Over-the-top melodrama. Stars Chales Starrett and Edward Van Sloan (FRANKENSTEIN/DRACULA). A small campus in the scene for a murder spree. A newspaper reporter is putting together the facts with danger at every turn. Old fashioned murder thriller! CLICK IMAGE FOR DETAILS. MURDER/THE LODGER (1930/1926) - Hitchcock Double Feature. CLICK IMAGE FOR DETAILS. Includes: THE BLACK CAT (1934), THE RAVEN (1935), BLACK FRIDAY (1940), THE INVISIBLE RAY (1937) and MURDERS IN THE RUE MORGUE (1932). Bonus materials include trailers from some of the films. Screwball comedy with Bob Hope and Dorothy Lamour. Lon Chaney Jr. supports as a "Lenny-type" thug. And, look at the other great cast members, veterens of classic horror in the cinema....Peter Lorre, John Hoyt, Charles Dingle and Reginald Denny! Excellent sci-fi adventure set in the 1800's. Captain Nemo's back and his island is full of giant monsters created by special effects genius Ray Harryhausen. Narrated by Peter Graves. In the late seventies, these type of documentaries became very popular....this one features a lot of Bigfoot, Abominable Snowman, Loch Ness Monster, and others. Actual footage and interviews, mixed with re-creations, Bigfoot make-up was actually pretty good. Bela Lugosi takes his turn at an answer to Karloff's MASK OF FU MANCHU. Lugosi resides in tunnels and hidden rooms. CLICK IMAGE FOR DETAILS. 50 Movies in one box set. Stars include James Cagney, Boris Karloff, Basil Rathbone, Mickey Rooney, Frank Sinatra and Orson Welles. For movie listing, CLICK IMAGE. A complete mystery movie collection in one big box. 50 films! CLICK IMAGE FOR TITLES AND DETAILS. Over 13 hours of movies! CLICK IMAGE FOR TITLES AND DETAILS. Stars Noah Berry. Science fiction elements are mixed with murder on the high seas. Wild lab equipment too. You'll never look at your radio in the same way again. Universal finished Charles Dicken's story and made this film. Claude Rains stars as the choir master wrapped up in the shrouded mystery. The creepy sets and a very intense thunderstorm sequence are highlights. Don't miss this well-acted thriller! Stars Patrick Knowles, Maria Montez and Maria Ouspenskaya. Very loosely based on an Edgar Allan Poe detective story. A singer is found murdered and there's a cloaked phantom running the rooftops! Boris Karloff as Mr. Wong is on the trail of a stolen, priceless gem. There's a shrouded mystery that leads to death. Same year that Karloff portayed the monster for the last time in SON OF FRANKENSTEIN. Fun Wong entry. A re-make of THE 13TH GUEST that moves along at that snappy 1940s pace. One scene is rather shocking, for its time, as a man staring directly at the camera, is finally recognized as dead, a corpse. Great little reunion for a reading of the will, spooky house movie. THE MYSTERY OF THE WAX MUSEUM (1933)/HOUSE OF WAX (1953) - Double Feature. CLICK IMAGE FOR DETAILS. Midnite Movies! -- MYSTERY ON MONSTER ISLAND (1981)/GORILLA AT LARGE (1954) - Double Feature. CLICK IMAGE FOR DETAILS. Stars John Trent, Milbourne Stone, Marjorie Reynolds and Jason Robards. CLICK IMAGE FOR DETAILS. Stars Tom Tyler. A western book author is invited to a real cowboy ranch. The people on the ranch set-up events like a hanging to prove to the writer that things are a bit tougher in the real wild west. Fun old cowboy flick! Stars Hedda Hopper, Marceline Day and Nick Stuart. A escaped convict, a wealthy woman, a triangle and stolen gems all lead to an intense ride on "The Mystery Train." A 1930s silver screen thriller. Stars Madame Houdini and Robert Fiske. A fake psychic takes clients on a run over the world looking for dead relatives spirits. Stars Madame Houdini, widow of the famous magician/escape artist and spiritualist Harry Houdini.